Safely protect and store your coins for future generations. Properly storing and protecting your coin collection will keep it in top condition for generations to come. One of the greatest joys of coin collecting is showing your collection to other coin collectors, family and friends. Coins are actually pieces of art that tell a story and those stories are intended to be memorialized on coins for generations to come. If you acquire the right tools and supplies you will be able to store the coins in your coin collection and protect them from damage. Follow these guidelines and you will be on the right track to storing your coins properly and preserving them for future generations. The most common way coins are damaged is by improper handling. Always try to hold a coin by its edges so that the oils and acids of your skin do not come in contact with the faces of the coin. If the coins are in a special holder, for example from the mint or grading service, you should leave them in their holders or capsules and not remove them. Some collectors will remove their coins from their coin holders because they prefer to house their coin collections in special albums or cases. Learn how to properly handle your coins so that you will not damage them and you will be able to enjoy them for years to come. Every coin collector will need several coin collecting supplies in order to properly house their coin collections and enjoy the work that they have accomplished in assembling their coin collections. Depending upon the way you prefer to house and protect your coin collection, will determine the coin supplies you need. This includes coin holders, folders, albums, magnifying glasses, proper lighting, books, gloves and a soft pad to work on. Beginning collectors will only need the basic supplies, while intermediate and more advanced collectors will require a wider variety of equipment and supplies. As coin collectors become more experienced and advanced, the coin collecting supplies they require will also change. You will move from collecting coins by just date and mint mark into new areas such as die varieties or error coins. In order to verify that a coin is authentic and not a counterfeit, you will have to acquire coin collecting supplies such as a digital scale, a digital caliper, a stereo microscope, a natural daylight lamp, high-quality digital camera and coin cataloging software. Whether you are just a beginner coin collecting or you are an advanced collector that has many years of experience, you may want to house some of your collection in a coin folder or coin album. Both options offer the advantage of organizing your collection into a predefined order. This allows you to quickly see what coins you are missing and need to acquire. Coin folders are inexpensive and great for beginners. Intermediate and advanced collectors will want to invest coin albums that provide additional protection for their prized coin collections. But, for advanced coin collectors, these folders and albums may not provide adequate protection for extremely rare and valuable coins. Coin holders allow you to store your coins so that they will not be damaged by mishandling or other environmental factors. There are many varieties of coin holders that you can use to organize your collection and each one has advantages and disadvantages. 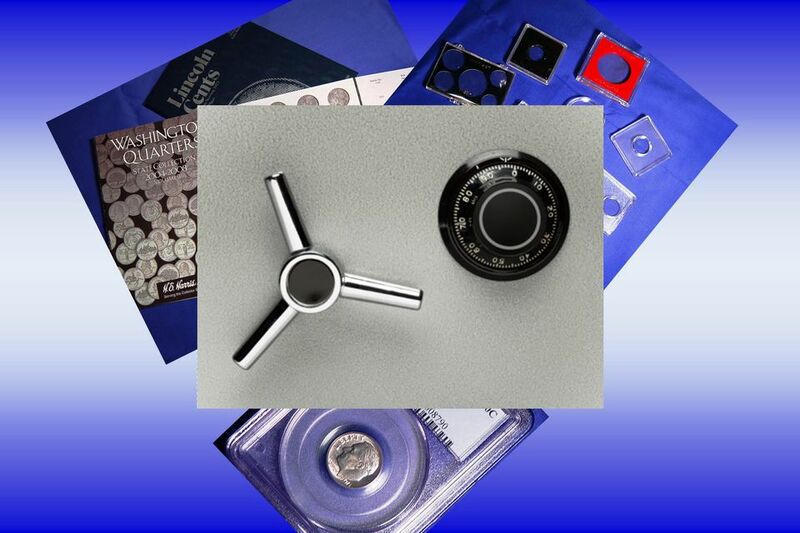 From inexpensive 2 x 2 coin holders to expensive, encapsulated coin holders provided by third-party grading services, you will be able to find the coin holder that meets your coin collecting needs. For expensive and rare coins, the only choice that makes logical sense is to protect them using a third-party coin grading service’s encapsulation process. Not only do you get the best coin holder that money can buy, but you are guaranteed that the coin is authentic and you have a professional numismatist's opinion as to the coins grade. However, encapsulating your coins are not necessarily limited to extremely valuable coins. A prized coin in your possession that may not be rare or valuable, but has significant sentimental value may be worth investing in the cost of having the coin encapsulated by a professional third-party grading service. Putting your coins in coin holders and albums are the first step to ensuring your coins are protected. But where you store your coins is just as important. The major causes of damage to coins (other than mishandling them) are humidity, extreme heat or cold, acids, chlorine and air pollution. By understanding how each of these factors can damage your coins, you will be able to take additional steps in determining where the safest place to store your coins is. Nobody ever wants to think about their coin collection getting stolen or destroyed. But it's a fact of life that these things do happen. With the proper protection for your coin collection you can minimize the chance that a thief will steal your valuable coin collection or it will get destroyed in a fire. If either of these things happen, you can ease your suffering by having adequate insurance to cover the cost of replacing your prized coin collection. One of the characteristics that differentiate "coin collectors" from "coin accumulators" is that they are compelled to catalog their coin collections. Keeping a written record in the form of a catalog is an important aspect of coin collecting. If you have an insurance policy to protect your coin collection in case of a loss, a detailed catalog of your collection will be required when you file a claim. Additionally, you will know exactly what coins you have and what coins are required to complete a particular series in your coin collection. Finally, there are many ways that your coins can get ruined. From touching your coins to improperly storing your coins, to experiencing a loss of your coin collection due to fire or theft, the list can be endless. Careful planning and common sense will help you store your coins properly in order to protect their value. Here are the top seven ways that people end up ruining their coins and sometimes experiencing significant financial loss.